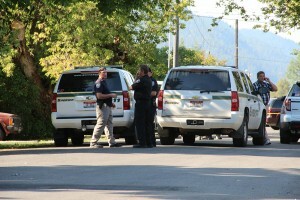 An officer-involved shooting in northern Sandpoint left one unnamed suspect dead late Tuesday afternoon. According to Bonner County Sheriff’s Office Captain Ror Lakewold, both the sheriff’s office and Sandpoint Police Department are involved in the shooting, which took place at a residence on Ruth between Chestnut and Spruce streets. Law enforcement officials are not releasing any names or details of the incident until the official investigation into the shooting develops. “What transpired won’t be released until further investigation takes place,” said Lakewold. That investigation will be headed up by the Kootenai County Sheriff’s Office, a member of the Region 1 Critical Incident Response Team. According to Lakewold, Bonner County Sheriff Daryl Wheeler helped the officers involved in the incident immediately afterward to ensure their needs were met. Details surrounding the shooting are still unconfirmed and won’t be verified until a complete narrative is released. However, neighborhood members reported hearing several loud pops, startling them and prompting them to investigate the situation. Moments later, Sandpoint Police and Bonner County Sheriff officers arrived to contain the scene and cordon off the area. Beth Pederson, who lives near the site of the incident, said she heard some of its aftermath. UPDATE: According to the Bonner County Dispatch press log, officers arrived at the site of the shooting to conduct a felony warrant arrest. Ponderay police assisted in the aftermath of the shooting. Next story Kansas Has the Red State Blues; Will Idaho Catch It?